Australian landscape design is eclectic but there is no doubt that we love to be outdoors, and with the population set to rise, whether we like it or not we will be left with smaller and smaller outdoor spaces in which to enjoy our way of life. Considering the whole of site as the canvas for indoor/outdoor living means we can get the best use of every square centimetre of space. Not everyone has the luxury of designing their site from scratch and this book will inspire the reader to see what can be created in restricted spaces. The book is divided into two parts: ‘Gardens’, an inspirational section which features 14 gardens ranging from small contemporary courtyards to more traditional gardens that respect the era of the home; and ‘Elements’, a more practical section which discusses both natural elements and design elements and how they work together to create a beautiful garden. “…has well-expressed ideas, thoughtful analyses of design challenges and a wealth of both theoretical and practical design advice. Even a hardened old-hand like me found plenty to stimulate, engage and yes, drool over. Rating: 4.5 stars” — Catherine Stewart, award-winning garden journalist, photographer and writer for garden magazines such as Backyard & Garden Design Ideas, Outdoor Design & Living, and Gardening Australia, co-author of ‘Waterwise Gardening for Australia’. Contact Janine to purchase your book today for the special price of $59.95 including postage & packaging to an Australian address. PUBLICATION DATE: 1 August 2012. 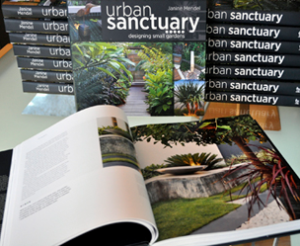 Award-winning Western Australian garden designer Janine Mendel’s unique approach to urban landscape design is showcased in this stunning book. Her contemporary designs reflect the Australian lifestyle and our response to the demands of a harsh climate. 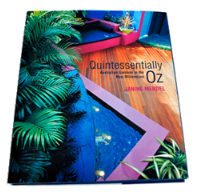 Produced in a lavish hardcover format, Quintessentially Oz is a book for modern Australian living, reflecting the brightness and optimism for which Australians are renowned. It features a collection of hand‐drawn and coloured plans chosen from the 700+ gardens that Janine has designed which illustrate her geometry of garden design. For people wishing to reinvent their garden — or just wanting some inspiration — this book will be a welcome new title. PUBLICATION DATE: November 2006. OUT OF PRINT. A new book by Anne Vale featuring Janine Mendel amongst other influential garden shapers & creators. 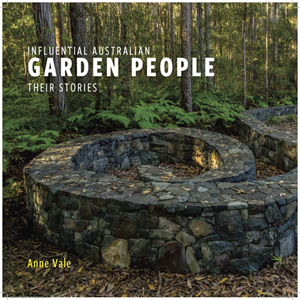 Beautifully illustrated, fully indexed and referenced,Influential Australia Garden People: their stories follows the influences of our current generation of garden writers, media personalities and garden designers. Journey with them as they relate their own experience within the context of increased urbanization, shifts in lifestyle choices and concern for environmental sustainability. Janine is honoured to be included in Anne’s beautiful new book along with the likes of Paul Bangay, Myles Baldwin, Jim Fogarty, Andrew Laidlaw and Arno King. Buy your copy today for $49.99 from heriscapes.com.au. CultivArt’s gardens have also featured in the following books, newspapers and magazines in Australia and around the world.